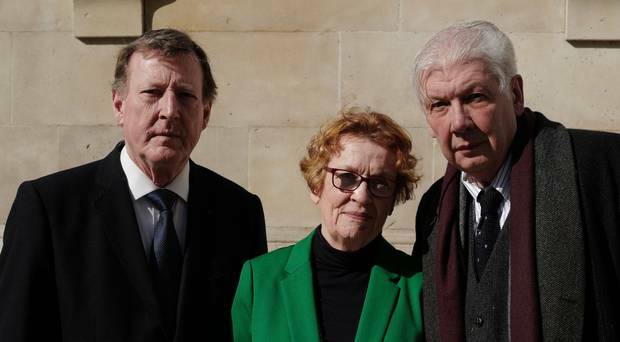 With Lord (David) Trimble as the leading claimant, along with, so far, Lord (Paul) Bew, UUP councillor Jeff Dudgeon and me (under the banner of The Belfast Agreement Defence Group) a letter has gone to the British Government requesting a judicial review of the backstop in the proposed Brexit withdrawal agreement. The objective is to persuade the British and Irish Governments to honour the Belfast (Good Friday) Agreement by dealing with the issue of a hard border, that no responsible person wants, by sorting out alternative arrangements through the British-Irish Intergovernmental Conference. The argument has been coherently and intelligently constructed by good legal minds who actually know what they’re talking about (including Lord Trimble and barrister Dr Austen Morgan, author of The Belfast Agreement: A Practical Legal Analysis). It is late – but not too late – in the day to try to save us from the worst possible result for everyone in the United Kingdom, other than those who would be happy for us to be trapped as EU vassals in a farcical set-up that is in the interests only of those who want to frustrate the results of the referendum. What has been alarming is not just that the Irish Government has obediently consented to the Belfast Agreement being weaponised by Michel Barnier, Jean-Claude Juncker, Donald Tusk, Guy Verhofstadt, Martin Selmayr and all the other cynical Eurofanatics who have exploited a bogus problem, but that Theresa May – who calls all the shots on this in the British Government – and her team of Europhile civil servants, who seem to have no understanding whatsoever of the Belfast Agreement, have caved in on the principle, and have closed their ears to eminently practical suggestions from authorities like Dr Graham Gudgin on how to make a soft border work. The Prime Minister seemed to have paid no attention to the recent challenge from Lord Bew (a Remain voter) that London had unquestioningly accepted the Irish narrative about the Brexit threat to the Agreement. When last week I was asked to get involved I remembered the vow I had made in 2009 after the judgment in the civil case against some of those who bombed Omagh in 1998 that I would never, never, never again get involved in a law case. Through courage and endurance the families had won, but it had been a long and exhausting haul. I had been involved with it from the very beginning – when a bereaved father first had the idea – helping with organisation, fundraising and publicity over years of frustration and disappointment, then with months of boredom and irritation in courts in Belfast and Dublin. And while my side won, legal aid-financed appeals have dragged on over the years and the families haven’t had a penny from the bombers. Nonetheless, I have no doubt whatsoever that it was worth it, for it opened a whole new way for victims to make terrorists face justice. I haven’t forgotten that for years lawyers in London, Belfast and Dublin sneered that the case hadn’t a chance. And as I read a sniffy article by a Newcastle legal academic dismissing the case as Lord Trimble’s misguided “quest for relevance in his political twilight”, I remembered that in the early days of trying to get the Omagh case off the ground David Trimble had sufficient faith and generosity to give us £5,000 – which is one of the reasons I agreed to break my vow and join with him on this. The other is that I care passionately about the importance to democracy in the United Kingdom of not letting down Leave voters who are now questioning if their votes mattered at all. At best, we will throw a legal spanner in the words leading to a destructive backstop. At worst we have given the Government ammunition to fight a permanent imposition. Crowd-funding (https://www.crowdjustice.com/case/judicial-review-of-irish-backstop/) is a wonderful thing, and as I write we are within sight of meeting way ahead of time the target for the first stage of proceedings. But we’re not there yet, and if the case drags on, we’ll be needing our supporters more than ever. Ruth Dudley Edwards is the author of Aftermath: The Omagh Bombing And The Families’ Pursuit Of Justice.